Many of our readers may know that one of our main contributors here is Tina Yi who, like many Americans, has close, direct ties to the Philippines. On Monday evening here as the sun was rising in the land of 7,000 plus islands, I was contacted by a person I know well, former Senator and current Philippine Red Cross Chairman, Richard Gordon asking for any assistance we can drum up to help in the wake of country wide flooding. Fueled by annual monsoon rains and an approaching low pressure system, nationwide flooding in the Philippines reached its breaking point Tuesday, causing a massive flooding, loss of power, landslides and food shortages. The inevitable disease stricken period to follow the 504 millimeters, almost 2 feet, of rain Tuesday, with more on the way, could cause a nationwide outbreak of various water-born illness including cholera and malaria. According to recent reports, 80% of the country’s capital, Manila, which houses nearly 20% of the country’s population, was affected by the flooding and hospitals are without backup generator power at present due to damage sustained from the torrential rains. 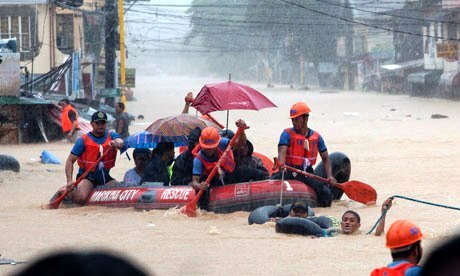 The nation’s weather service, the Philippine Atmospheric, Geophysical and Astronomical Services Administration, has issued warnings to the country’s 66 million residents of continued torrential rains and serious flooding through thew weekend. Click here to view the current weather radar for the Philippines. Tina, whose family members were uncontactable, hails from the Zambales province near Subic and Olongapo where the U.S. Navy was stationed during the post-Vietnam area. I spent the entire evening last night, all morning and afternoon today until just now working the phones and contacts I have to drum up any form of assistance for those who have been destroyed by the recent rains. If you would like to lend your own assistance voluntarily, feel free to contact The Philippine Red Cross at http://www.redcross.org.ph/donate. Bottom Line: This hits home harder than usual because of some personal ties that both Tina and myself have. On behalf of Tina, we apologize for not being able to focus our attentions today on the happenings on the OTC markets and hope to be on target for the latest and breaking penny stocks come Wednesday. Last updated by Timothy Richards at August 7, 2012 .